BBC NEWS | Africa | How do we stop malaria? How do we stop malaria? As we mark Africa Malaria Day on 25 April 2006, what can we do to stop ourselves becoming infected with the disease? Malaria is one of the world's most deadly diseases. It kills three times more children in Africa than HIV and Aids. Effective ways to stop malaria spreading include spraying homes with the controversial insecticide DDT as is done annually in parts of South Africa, and the mass distribution of mosquito nets as recently happened in Niger. What do you think is the best way to stop malaria? What do you do at home to prevent your family becoming infected? What is your view on the use of DDT? I cannot believe that anyone still believes DDT is harmful. South Africa has successfully applied DDT in the KwaZulu-Natal Province and reduced Malaria cases from 40.000 to 3000 in 2002. I grew up in the Cameroon in the 1960s in a house that was sprayed once a year with DDT before the ban and I am still healthy. I agree with the contributor from Ghana. When we keep our environment clean there is less of a problem with malaria. My problem with mosquito nets is that they were developed without considering the weather in West Africa. In fact you can suffocate to death when you sleep under them on a very hot day. First and foremost, I would like to strongly disagree with the comment from a fellow African living in Finland. To say "the West can never develop the proper remedy for malaria because its not a Western problem" is to be defeatist. After all didn't the West develop vaccines that eradicated smallpox and kept many other epidemics at bay? I was glad to hear Richard Tren, Director of Africa Fighting Malaria, who was on the radio debate on Wednesday say that malaria is a public health problem. I am currently writing a history of the city of Kampala, and I have been struck by the contrast between the situation in the early 1950s, when malaria control was defined as a responsibility of the city council and health care was provided free, and the present, where responsibility is being placed on individuals. Kampala is a much larger city now, with much less control over housing, but we also have lost the sense of social responsibility. I've had malaria at least 50 or more times in my life. It is a deadly diseases. In fact more deadly than HIV/Aids, but less resources are dedicated to eradicating malaria than HIV/Aids and bird flu. Is the poor funding and slow pace of research into eradicating the disease due to the fact that it is absent in western countries? To stop malaria, we must invest more resources into research, education, advocacy and action for change. Mosquitoes comes from the rubbish we throw in gutters and dust bins. They are uncared for, hence we get too much mosquitoes. I advise all of us to try and keep our homes clean and even on the streets, we should learn to throw rubbish in public bins and not all over the streets. African leaders should challenge the African researchers to find local remedies, to be supported by Western medicine, where needed. The West can never get the proper medicine to prevent or cure malaria in Africa. It is not their disease and their pharmaceutical companies are only interested in money! The pharmaceutical industry should move rapidly in developing vaccine for malaria. In the meantime, effective anti-malarial drugs, insecticide-treated bed nets, mosquito repellents(sprays, creams, ointments) should be made available, affordable and accessible to all vulnerable communities. African governments should reach out rural areas where malaria is reaping havoc. The western world has a moral obligation to prevent malaria-related deaths in Africa. Malaria was for all practical purposes under control throughout the world before DDT was incorrectly banned for the use of mosquito control. The World Bank has erred by placing a condition on loans that DDT is not to be used for mosquito control. All African leaders have their heads on the Aids Pandemic, maybe because it's more lucrative in terms of financial assistance. The same amount of investment that is allocated to fight Aids should be available to fight malaria. This is an important issue because it's mostly children who are most vulnerable. "Prevention is always better than cure". We should keep our environment clean, avoid stagnant waters that breed mosquitoes, allow light passage into our rooms, use medicated nets and mosquito repellents such as the coils, paints, sprays and creams. Moreover, we should report symptoms to qualified medical personnel as soon as possible. My 19 year old step-daughter died just under three months ago from cerebral malaria contracted whilst visiting her father in Uganda for Christmas. The medical professionals all diagnosed flu. The dangers of malaria are not fully recognised in the West - malaria is a killer, people must be made more aware. Many people hold the belief that malaria does not kill Africans. They see it as a normal thing for a person to suffer malaria from time to time. A change in this attitude will go a long way in stopping the problem in Africa. At the time of writing I am finishing a course of malaria treatment - the second in one month. So too is my seven-year-old daughter. Why can these therapies not form the basis for producing an effective vaccine against this killer? It is surprising that the sanitation in towns and cities is not being talked about perhaps because of the costs. Drains must be properly engineered, farms must be far off from dwellings. While living in Tanzania I got malaria. When visiting Indonesia I found out that many believe that eating boiled papaya leaves will cure malaria. Personally I think that it is the bitterness of the leaves which enters the blood stream, that helps repeal the mosquitoes just as I heard that eating bananas will do the contrary: the sweetness attracts them. In my homestead, we clear any stagnant water by digging channels that empty such "basins" that water collects, we also use nets and coils. DDT is a no no, unless you want to risk the health of unborn children. We also encourage people visiting to take malaria medicine prior and during their visits. We have to allow the use of DDT, there is not one single provable instance of death due to the use of DDT. 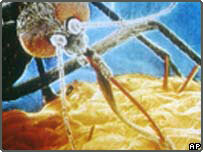 In the days of DDT malaria was virtually eradicated worldwide. Malaria was eradicated in the United States more than 50 years ago. It is time the developed world united to rid Africa of malaria by utilizing the same measures used in the U.S. and Europe to control mosquitoes. These measures include controlling breeding grounds, improving drainage, and using insecticide spray. DDT is safe when used properly and should be available to African nations. In the meantime, mosquito nets should be given to all mothers. Perhaps one of the major universities (or a combination of) could mutate a sterile male mosquito to mate with the females, thereby slowing down the tremendous insect infestation. African countries should subsidised medicines and mosquito nets. For example Kenya subsidised treated nets which used to cost about Ksh. 400 (about US $5.70) to Ksh. 50 (about US $0.70). It was only for pregnant mothers and young children under five years of age and wasn't enough. The government should also do the same with malaria medicines. In my country nurses don't like to give free nets offered by the government to pregnant women, they will instead ask for payment, hence poor women go without these nets. It's scary. Ronald Ross won the 2nd ever Nobel prize for Medicine in 1902 for his work on this killer disease and it's vector, the Anopheles Mosquito. Here we are over 100 years later still trying to eradicate a killer that kills more, but gets less publicity, than AIDS and even bird flu which has so far killed a mere handful of humans. Why? Don't we care? Or are we just too wrapped up in supposed threats to westerners? I think we must find ways to eradicate mosquitoes. It's such a great pain to suffer from malaria. First and foremost, I try to ensure that sunlight enters all the nooks and corners of my house by keeping all windows open for at least 1 hour every day. Mosquitoes thrive on dampness and darkness and exposure to sunlight drives them away. Similarly one must close all doors and windows much before the sunlight leaves the house. I also always wear long-sleeved shirts and avoid wearing knickers or shorts. It has been 16 long months in Lagos and I have been successful in keeping malaria at bay. So far that is! I believe in getting rid of all the still waters that mosquitoes breed and introducing fish in ponds; cutting of grass and fumigating all forest areas; educating the people of the symptoms so early treatment is sought. The only prevention for malaria is a change in our attitude. We should clear and avoid stagnant waters around us, and stop stuffing our gutters with all kinds of garbage and leaving rubbish unattended to all over the place. In short, we should all practice good hygiene to prevent catching any disease at all. My family never worries about malaria because my grandmother knows how to deal with the situation. She always makes sure that she collects enough dry dung for the fire that chase mosquitoes away from entering into our house. I grew up having malaria fever practically once in every month of the year! Before I left Nigeria, the vogue was the use of certain preventive drugs on regular basis, like weekly or monthly. Somehow I just feel preventive medication is not the best, medication as a rule makes the liver work extra time. In my view the best way to stop malaria is the combined use of treated nets and insecticide. I suggest this because net can only be used in bed and not around the house like the veranda. The insecticide can be used both in and outside the house. In the last three years my family has relied on both methods and it has not failed us. Knowing the bad aspects of DDT for future generation we still use it. When we use DDT to protect what is in front of us, we tend to forget there will not be a normal future. I hate to accept there is no option but DDT while countries do not focus on finding a way to get rid of our muddy swamps. If a vaccine is not developed, we have to mobilise the whole universe to eradicate still water by providing an underground drainage system. We use mosquito nets and coils which emits smoke to kill the mosquitoes. I do everything possible to avoid DDT. It could be harmful to one's health on the long run.